“Obviously, the teeth were sad when they were covered in these Velcro germs before the kindergartners took a giant toothbrush and actually brushed those little germs off the teeth with me, showing them they were in the grooves on top of the molar and on the front, back and sides of all the teeth,” Dr. Courtad said. “I got the idea that the more visual I can make this, the better,” she said. “The three teeth that I carved became the characters of the book. I wanted the names to be close to what their clinical names are. So, Incisa is kind of a spokesperson for the mouth, right in front of the mouth, explaining the scientific concepts. The tongue is also a character personified in the form of Tongo. “The tongue is considered the antihero in the books because, even though he helps clean any sticky sweets off the teeth, Tongo is the one wanting them in the first place,” Dr. Courtad said. “Becoming Me Cavity Free!” is a primer aimed largely at expectant mothers to aid them in caring for their babies’ primary teeth. Dr. Courtad collaborated with the University of Maryland School of Public Health’s Herschel S. Horowitz Center for Health Literacy and its founder, Dr. Alice M. Horowitz, to create a story for educating underserved expecting parents. They envisioned that the book also could be an educational aid in other settings, for example, in doctors’ offices to help general physicians and obstetricians educate pregnant women on oral health during pregnancy and after babies are born. Public health departments have ordered “Becoming Me Cavity Free!” to package in their well-mother care kits, Dr. Courtad said. One such municipal body, the Lincoln Trail District Health Department in Kentucky, uses “Toothful Tales: Becoming Me Cavity Free!” in a community outreach program to pregnant women within its six-county district area. “These books will help provide a great deal of the education because they are easy to read and provide important information to pregnant women using fun graphics,” wrote Diana Leathers, Maternal Child Health Coordinator and a registered dental hygienist, in a testimonial blurb to Dr. Courtad. 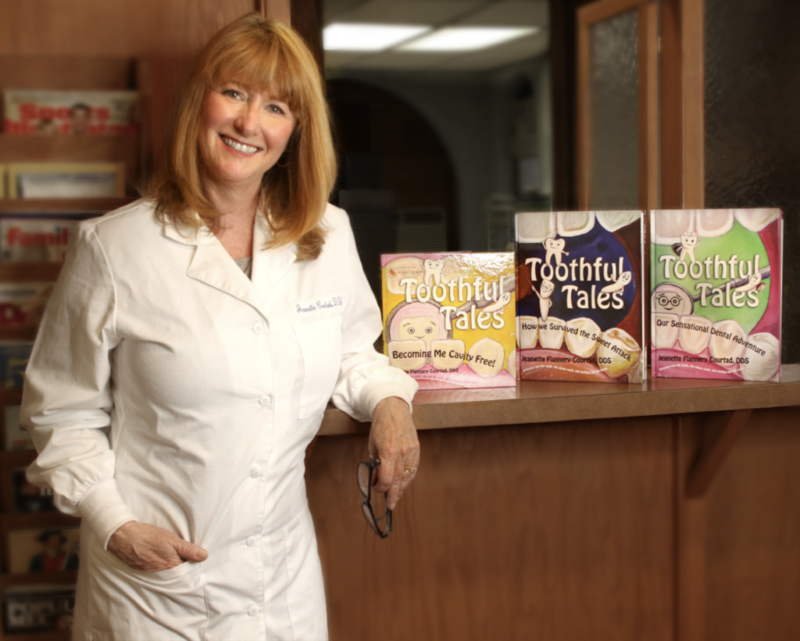 Ms. Leathers wrote that the health department uses the “Toothful Tales” book to engage patients in its Women, Infants, and Children (WIC) program and its Health Access Nurturing Development Services (HANDS) program. “After searching many places for a book to increase oral health literacy for pregnant women, Dr. Courtad’s books were a perfect answer! We have also used these books with our HANDS and WIC patients in the past to increase oral health literacy — both English and Spanish versions,” she said. Dr. Courtad and Dr. Horowitz again will collaborate (with dental hygienist Sharon Clough) in a training at ADA 2018 – America’s Dental Meeting in Honolulu. Their session, part of a series of courses that include information on fluoride, is Preventing Caries in the Pregnant Woman and Her Child (7800), Oct. 20, 7-8:30 a.m.
For more information on Dr. Courtad’s books, visit www.toothfultales.com. To register or learn more about ADA 2018 – America’s Dental Meeting, visit ADA.org/meeting. Good post, Thanks for the sharing.